Sense of Place – fiber art from pictorial to abstract, crafted by artists of the Journeys Group will be featured at Sisters Art Works January 8 through February 28, with an opening reception January 18 from 5 to 7pm. 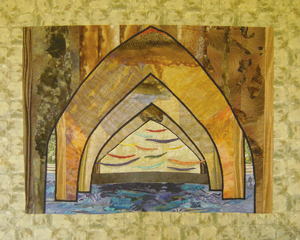 Journeys is a group of 14 regionally-known art quilters dedicated to creating original art expressed in their own unique style using fiber art. Their diverse skills are well represented in their latest exhibition, Sense of Place, which illustrates that “places” are visually interpreted in different ways by different artists. The works in the exhibition vary from the pictorial to the abstract. 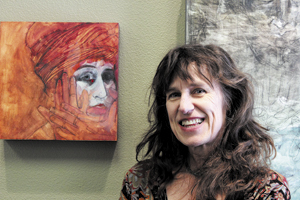 In one work Tumalo Falls artist Donna Cherry demonstrates why she is known for her pictorial images. She says that her “sense of place” is anywhere close to nature. Her work reflects her love of “God’s creation” and is shaped by her many visits to the falls in the 28 years she has lived in the area. In another work, Mary Stiewig demonstrates her abstract skills in How Firm a Foundation which was inspired a Stephanie Ames photo of the Siuslaw Bridge in Florence, Oregon. The work uses various fused and stitched fabrics to illustrate her sense of the mysterious and spiritual look of the bridge’s infrastructure.